Bluestem Prairie Open Space offers 650 acres of prairie grassland and bird watching paradise. NOTE: No dogs are allowed, due to native wildlife. Home to over 200 bird species and several mammal species, Bluestem Prairie Open Space has become a refuge for a variety of native wildlife and vegetation. Located just south of the Colorado Springs Municipal Airport, this land once belonged to the Banning-Lewis Ranch. 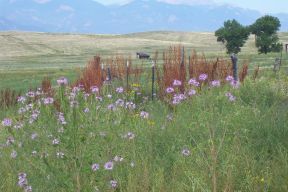 Here ranchers relied primarily on rich soils and thriving grasslands to survive. This land remains home to varied mammals such as the Pronghorn, the Black-tailed prairie dog and birds like the Red-tailed hawk, Burrowing owls and Migratory Shorebirds. Where is the Bluestem Prairie Open Space located? From Colorado Springs, take I-25 south to Exit 138. Turn east onto Lake Avenue, which will turn into South Circle Drive. Turn south onto Hancock Road, which will turn into Hancock Expressway. Turn east on Drennan Road. From Drennan Road turn south onto Powers Boulevard. The Bluestem Prairie Open Space will be readily visible after 1.5 miles. The Bluestem Prairie Open Space Management Plan was adopted by the Park and Recreation Advisory Board on March 10, 2016. We thank the public for their valued input and participation in the public process.